The Bible editions are coming fast and furious from the fine folks at Saint Benedict Press. They are now offering, via pre-order, two new editions of the NAB. They are both NAB gift Bibles to celebrate First Communion and Confirmation. As of now, they both come in hardbound editions and include a nice selection of Bible "extras". 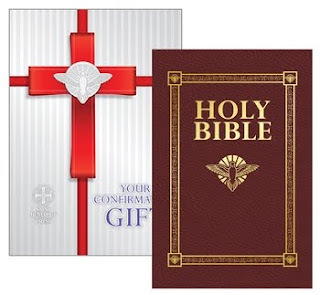 "This hardbound, gold-embossed New American Bible contains pages of colorful images, child-friendly stories on the lives of young Saints, daily Catholic prayers, including how to pray the Rosary, and explanations of the Seven Sacraments. This elegant edition also contains an explanation of the Mass and the complete Calendar of Sunday and Weekday Readings. The treasures discovered in this keepsake box will multiply the Graces received in the Sacrament of Holy Communion." "This hardbound, gold-embossed New American Bible features stories on the lives of young Saints, explanations of the Gifts of the Holy Spirit, and well-known prayers written in English and Latin. This elegant edition also contains answers to teens’ top questions about Catholic moral teaching and the complete Calendar of Sunday and Weekday Readings. The treasures discovered in this keepsake box will multiply the Graces received in the Sacrament of Confirmation." All I can say is "keep them coming!" I can't understand why they would release these with the NAB, when it is due for revision soon. It may have the NAB, but it will not be the approved NAB (with changes, removing inclusive language) used in the liturgy. RSV CE and Douay Rheims still better translations. Yeah, I am a little surprised that they are producing any new NAB's these days. I can understand using it because it is the main translation for Mass, but one would think that they would wait until the revised NAB is published sometime later this year or next. Perhaps they could have published just a New Testament version? Are these NAB bibles in a fresh typeset??? I seem to get that impression. I would hope so. I have always felt that if you have seen one typset of the NAB, you have seen them all. Good article on the New American Bible, vs better translations, (RSV, Douay, NRSV). From website "Sub Tuum".